The Pedego Boomerang Plus is the most accessible electric bike ever. The ultra low, 9” step thru frame makes riding fun and easy for more people. The first thing you notice when you ride a Boomerang is how comfortable you feel. You’ll swear it was made just for you – because it was! The most important part of any Pedego is the person riding it, and the Boomerang is built with only one thing in mind: YOU. In addition to the ultra-low 9” step-thru frame for easy access, the Boomerang is fully loaded with user-friendly features that make riding even more fun. From the simple pleasure of a built-in bell, to innovative Smart Bike Technology including a Bluetooth connected smartphone app; we’ve thought of everything! What really sets the Boomerang apart is its supercharged performance. It’s recognized worldwide as one of the most powerful electric bikes on the market, and it’s just plain fun and exciting to ride. The 48 Volt battery weighs less than a lap-dog and is made of the highest quality lithium-ion cells. It can take you up to 100 kilometres on about 10 cents worth of electricity. A whisper quiet, 500 watt motor delivers best in class acceleration and hill climbing. The sensation of power it gives you is exhilarating. Pedego Electric Bikes allow everyone to feel the freedom of riding a bicycle. They make you feel free. Once I decided to purchase an e-bike, I did a LOT of research. At age 77, it became clear that I needed a little help. My typical ride of 10-15 miles has some hills that were just doing me in. I looked at just about every e-bike on the market. I read reviews. I looked at specs. I considered price. And guess what? Pedego just ticked all the boxes on my spread sheet. Unfortunately, there is no Pedego dealer (yet) in Atlanta. If I were 20 years younger, I’d probably open a store. I made the trek to Blue Ridge Georgia. – a three-hour trip. It was worth it. I thought I wated to buy the City Commuter. But Darren suggested I take a ride on the Boomerang Plus. I was immediately hooked. Darren helped me load it in my car and I haven’t lookd back. In four months, I have ridden 5 days a week. I can keep the assist off for a big part of my ride. But when I need the help,it’s there. I’m riding further and having more fun. This is the third Pedego bike for us. Why do we keep purchasing a Pedego? 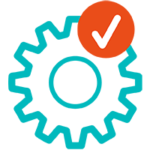 We keep purchasing them because of the quality, commitment and integrity of the company. When there was a problem with our first bike, Terry Sherry personally contacted us and solved the problem. This is why we are Pedego’s #1 fans. The bike sells itself. My experience with Alfred and Marc at the Tiburon store was exceptional. I can’t explain how much I am enjoying this bike. My knee injury has prevented me from enjoying biking- until now! I just purchased my new bike, here in Minnesota. We have excellent bike trails , but our time to ride our bikes can be limited to about 6 or 7 months ( unless you are a true adventurer and get yourself a Fat Bike). I have never rode an electric bike and decided on the Boomerang Plus. The first time I rode it was so much fun, and I can’t wait to get it on our trails, especially on some of our hills. I have had a hip replacement, and the low step thru on the Boomerang was a perfect fit for me. We also have a lot of windy days so the electric bike will be a treat. I can’t say enough about the folks at Straight River Sports in Owatonna Mn. 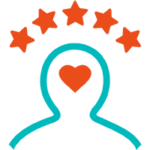 They were excellent in helping me choose my bike and their customer service was EXCELLANT. Many Thanks to Ann and her team. Im so glad Pedego Electric Bikes came to Mn. I strongly recommend giving them a try. I can’t wait to continue my new adventure on me new Boomerang Plus. Where have you been all my - cycling - life!? Very few things in life bring more pleasure than a bicycle ride. Add in electric pedal assist & even the hills are fun. 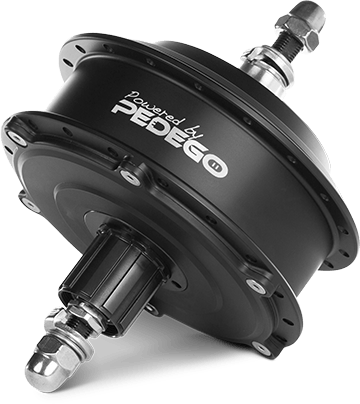 The engineering that went into Pedego design make for seamless operation of mechanical & electrical systems. An owner of a full high-mod carbon racebike (inc. wheels) that as a complete bike weighs 14.3 pounds – before pedals; I am truly amazed at how well my Boomerang Plus rides, handles, brakes and, of course, accelerates…a true revolution in cycling taken to a new level of enjoyment! I have had my Pedego for about 7-8 months now and absolutely love it. I use it to get around my neighborhood and take it with us on camping trips. It has been bullet proof so far with the miles and miles that i have put on it. I have owned 2 pedego bike, a comfort cruiser 3years. I bought my Boomarang last year. I will be 81 this summer, and find that the Boomerang is the best bike for me. I bought my Pedago bike, a Boomerang over two years ago. It’s a bright red color plus it’s a step thru so it’s easy to get on and off of. I have over two thousand miles on it and every where I ride everyone comments on my Pedago and asks how I like it. I tell them I LOVE IT. Thanks to Pedago I not only get exercise but I meet a lot of people while out riding my Boomerang bike. I bought my this past August (2018). 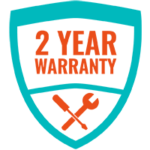 To be honest, I have had a few repair issues but this company stands behind its product. When I call in, I get results, not the run around. Customer Service is phenomenal and I am looking forward to having this bike for many years to come. What I love most about this bike is that I can ride for hours and the peddle assist gives me the ability to not worry if I am tired, I know I can get back home. I love my red Boomarang Plus. It’s a head turner everywhere I go.Everyone comments on the good looks of the bike.The excellent accelleration at a stop sign or traffic light lets me mingle with the traffic without any problem whats so ever.The seat is the most comfortable I’ve ever had.I usually do a 25 mile ride daily up and down the numerous hills where I live and never been caught by any hills I couldn’t climb.I love the cruiser handlebars because my back is not tired after a ride like it was with my other racer.Look wise,this is the Cadillac of bikes. What can I say about the boomerang that hasn’t already been said. Well for starters it’s a head turner. When people see me riding this bike I am often asked where did I get it. Of course I have to explain that it’s not just an ordinary bike. It’s a Pedego. The most popular electric bike in the country. And at the rate it’s going soon to be the most popular bike in the world. When they ask me to explain how the electrics work. I describe it as if when you’re learning to ride your bike and your mom or dad is running behind you holding onto the seat pushing you along. And we all remember how much fun that was. So writing a Pedigo put the fun back into paddling. You still get plenty of exercise but you can ride so much further. So I say goodbye to the old pedal bike. And hello fun. I live in Destin,Fl. And purchased My bike from Pedego n Santa Rosa Fl. We have bke trails along the beach roads but I would get bored riding My old bike because I could not go very far out due to worrying about the long ride back. Now, I can exlore more areas,not be concerned about a windy day or getting tired while still getting even more exercise than before. My husband and I each have a Pedego eBike and love them. We take them with us when we travel, instead of towing a car behind the RV. It is actually easier to get places with them and not have to worry about parking a car. We took them to an event where you had to park your car quite a distant and walk in. Not us, we rode our eBikes right in and had a front row seat. I’ve had my bike for 3 years and now my husband has one,too. Riding a bicycle has never been this much fun before. 2 hip replacements,heart valve but because of my boomerang I’m out there riding again. The Boomerang is my second Pedego. As age related changes occur in my knees mounting a bicycle becomes challenging. The Boomerang model is the solution. Designed and manufactured for physically challenged riders it is a joy to mount and ride. I know of no other company that has put so much thought and effort to offer a solution to a growing problem. Sharon and I are fortunate to have a trail system around Denver that is awesome. Also more nice weather days than most areas. The fallacy that Electric Bikes do all the work is so false. We go farther and more often than before “electric assist”. Yes it is more “FUN” and at our age the “move it or lose it” saying applies. This bike makes riding so fun and easy. Hubby and I do about 30 miles 3 to 4 times a week on the bike trails in Las Vegas and the Fl Keys. The idea of an electric bike has solved a problem I encountered with the issue of AFIB. I’ve always enjoyed riding my bike, however I have developed AFIB and could no longer navigate hills or upward slopes due to medication that I am taking. But , with the Pedego Boomerang, I no longer have any limitations and the joy of the freedom of riding my bike has returned. My wife and I each have one and plan on going on our longest trip this year. BTW, my wife has had double knee replacements !! In closing, just a special Thanks for all that you guys and gals do !! I’m a 67 year old female who loves to get outside for exercise. However, the arthritis in my knees makes it difficult to go out for long walks. With my electric Boomerang Pedego bike I can spend all afternoon riding around the lakes near my home. The hills don’t present a problem as I can fly right up them. I feel like I have so much freedom, and want to just go farther and farther. I do wish it were easier to ride without using the battery just in case I ran out. I find it harder to pedal than my regular old bike. The bike is too heavy for me to put on a car. Also, I would like to have turning signals on my new Boomerang Pedego bike. Maybe this is possible as I haven’t looked into it. My Doctors all told me to exercise, the problem was I have a bad breathing Problem and I could not exercise without running out of breath, It’s so bad that if I walk to my mail box I get out of breath. I bought my Boomerang almost 2 years ago I was very spectacle about spending money on a bike not knowing weather I could ride it without running out of breath. What iI did was, while in California I went to 4 Pedego dealers and test drove one of there electric bikes in each store. Low and behold I could ride the Pedego without getting winded. It was great.After i got my Pedego delivered to me in Wisconsin where I live I went for my first ride. I put my bike on my cars bike carier and drove to a business that had a 600 acre property with a bike trail thoughout the property. I Started riding for my first time other then those test drives in California I did not run out of breath. The reason was I could pedal the bike and adjust the gears from lite to hard peddiling The property i was riding on is real beautiful Lots of trees, ponds and meadows. So here’s the thing I put on 12 miles on those trails and NEVER got out of breath real bad. I puched it real had in some areas and pedeld lite in some areas. With my Pedego I can now exercise without running out of breath I can peddle to suit me Using the gears. I ride now on various trails that were’e so lucky to have in our Town . Its January now and today it is 20 below zero so I have to wait for spring to ride again. As soon as the water is soft again I’ll be out there. I have owned this bike for a year and it has been a joy to own. The battery is very realiable and seldom needs to be charged. The day a total stranger let me try their Pedego changed my life. I bought one the next day. I love doing my errands and riding to dinner or for happy hour. I committed to letting strangers try my Pedego and know that several purchased one for themselves.I always have a smile when I ride. My husband and friends call it the Pedego face. I own two Pedegos. I am so grateful for these bicycles. I suffer from several auto immune disorders that cause me to get tired easily and have severe arthritis. This bicycle allows me to ride with my husband, who is an avid cyclist. Instead of having to sit home and wait I am able to ride again with assistance but still get exercise. I highly recommend these bicycles. Forget your age-go have a blast! Having a Pedego is such a blast-as the 30-somethings are sweating to get up a hill whilemyou breeze by. My Boomerang takes me to work and back so my level of fitness has totally improved AND I have lost weight in the process. Pedegos are sturdy and reliable and take you to places you never thought you would go! Bought this 2016 the classic design with white wall tires and comfortable leather seat and black frame is an eye turner. Built solid and huge battery last and lasts. Visited the Pedego factory and the owner operators sold me with their PMA (Positive Mental Attitude) and Corporate Mission Statement First You Must Have Fun! A 73 year old senior in much need of exercise. The Pedego turned out to be the Silver Bullet. Hills in the neighborhood made it hard to ride. Sometimes I would get too far away from home and it would be a struggle to get back. Hard to ride with friends who set a pace I was uncomfortable with. No problems now. Look forward every day for a ride. Best thing I ever bought. No other exercise, I eat a little less but don’t diet, I live in south florida and could ride everyday but choose 3 days a week for about 10 miles a day, babystep, I have many other health issues, but have never felt better, good luck it works if you work it. I bought my bike in 2018 and have loved every ride I have been on. People stop and ask me about the bike and I always tell them to check out their local dealer, they won’t be sorry. So much fun to be outside and enjoying our country. At 84 years old I use the bike to keep my joints from freezing up completely from arthritis! I would fall over getting on except for the step thru frame & I don’t have to worry about getting back home with the battery assist! No other bike competes with this one! And insurance is only $68 a year! Bike works great as advertised. Service department is friendly and knowledgeable. Highly recommended. As We have aged, we started renting e-bikes on our travels to make life easier. We have rented many different brands, but none could compare to Pedego! We finally bought one for me (the wife) and I love, love, it! Eventually will get husband one also. Since getting my bike I have spent lots of time riding. The quiet is just what I need to calm my spirit. With the wind blowing and an open trail I don’t think you can have a better time when you want to be alone. The exercise it gives you is just an added benefit. My Pedego bike keeps me riding, even on the windiest days. Previously I wouldn’t ride on a windy day or would shorten a ride if winds whipped up (and that’s a lot of potential lost biking miles where I live). With a little electric assist, I no longer think about taking care not to go too far out that coming back would be difficult or having winds make the ride too much endurance and too little fun. Yay, Pedego . . . go . . . go! In 6 months time I pedaled over 1000 miles on my Pedago electric bike. That’s exactly 1000 miles more pedaled than I would have biked on my regular bike! Before i gained the confidence the Pedego gives me, I wasn’t riding my bike often and when I did I was stuck doing short rides to be certain I wouldn’t run out of energy away from home. Once I got a Pedego, I could sail off into the unknown and truly explore the marvelous area I live in. The best part is just getting out there quickly built strength as I pedal the full way using assist on hills and into the wind. Thirty mile rides are now normal for me and looking forward to longer treks next summer. My Boomerang Plus Pedego bike changed my life.I had health issues three years ago and was unable to ride my mountain bike.I purchased my Pedego and it has changed my life.I can now get out on the trails where I live and have lost weight and my overall health is improving.It is the high point of my day.Boulder Pedego also was invaluable with all the help and information they provided me.Love biking again…thanks Pedego!! From their friendly sales team to their eager response to any issue with my riding experience, the Pedego crew excels in every aspect. In good weather, I ride 25-35 miles daily and I am 69 years old with bad knees. I wouldn’t be riding a bike if it wasn’t for Pedego. Need I say any more? I’ve had my Pedego about a month and it just flattens out every hill I can find. Quality, serious fun! I have owned my Pedego for about 6 mos and I really love it. I use just enough power assist to get me started but knowing it is there gives me confidence to keep going when I get a little tired. So far I just ride in my neighborhood but I am looking forward to finding a longer route where I can really open it up. My Pedego has enabled me to continue to enjoy the beauty of outdoors, while obtaining a nice level of exercise. Being in my 80’s, I have given up sports, but the fun of cycling motivates me to stay active. Thank you Pedego. We just got our Pedego bikes about 2 weeks ago. We absolutely love them. We started out riding them for about 2 miles, then up to 5 miles and now riding 10 miles, weather permitting. So much fun! We look forward to riding a lot and travel with our bikes this summer. With feet problems, this is a way for me to get exercise and have a blast. HELLO FUN! I am a 74 year old that discovered Pedego. I bike, with Pedego’s peddle assist, about 5 miles daily. I look forward to each ride; my Pedego excursions provide needed exercise, and time alone. Pedego’s quality is outstanding; they created a bike that is user as well senior friendly. Great job! The perfect bike for anybody that has trouble lifting their leg or has balance issues when getting on a bike. The step thru area is so low and convenient. I love everything about this bike. It has a smoothe ride and is easy to operate and fun to ride. I haven’t ridden a bike in years and I feel like a kid again when I cruise on my Pedego. I have Muscular Dystrophy and without the assistance of the electric motor I wouldn’t be on a bike. We have taken our bikes on long trails and seen so many things you can’t see from a car or walking. BUT…make sure you get two bc a regular bike rider will have a hard time keeping up with you. LOVE my Pedego Bike! My hubby and I are 68 and were feeling too tired a few years ago after our 15 mile beach rides. 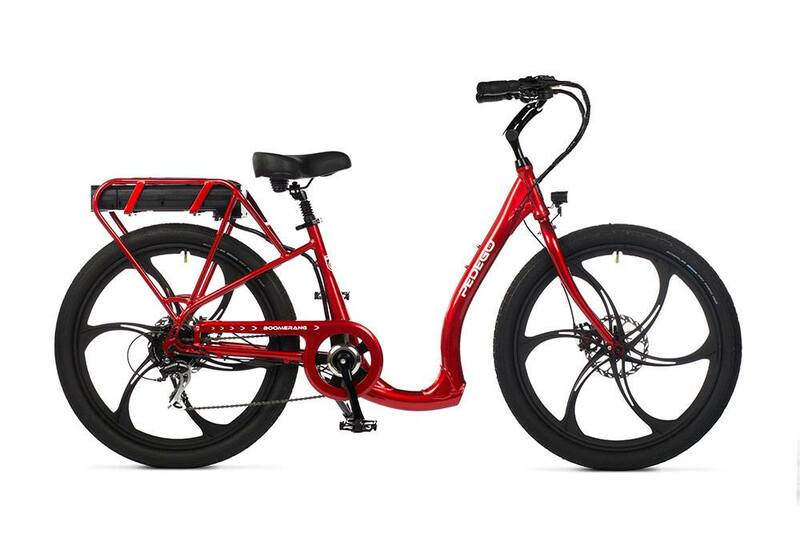 So we opted to buy two beautiful red with cream trim Boomerang Plus E bikes from Pedego in Marina del Rey. We tried them out first for a ride and loved them and loved them and immediately put in an order. Now we ride about 28 miles each time we go out which gives us more time in the great California sun and we don’t ache the next day!! It improved our quality of life and was worth every penny!! I have been riding bicycles all my life. It has always been a pleasure. It was getting more difficult as I aged. I found myself using any excuse not to ride my bike. It’s too windy. Whatif I encounter a big hill. What is I’m unable to make it home. At 67 years old I am enjoying riding my Pedego. No more excuses, I don’t hesitate to go for a ride anytime. Now I can ride with my grandkids and don’t hesitate to ride anywhere. Buying a pedego was a great decision. My only caution is that if you are a couple be prepared to buy 2. My wife bought on and a month later I bought one. Bike riding has never been so fun. We thoroughly enjoy going out on 10-20 mile rides and can still peddle and get plenty of exercise but can cruise home if the weather turns or we get tired. Don’t put it off buy one, you won’t regret it. My Boomerang allows me to carry alternative transportation on my RV without having to tow another vehicle. The Boomerang is so easy to get on for those o us with him and he’s issues and Bill riding is a breeze for us retirees with the powerful motor. He!lo Fun! I pedaled a little over 1000 miles in 6 months. That’s exactly 1000 miles more than I would have pedaled on my regular bike. Seven years ago we purchased 2 City Commuters and rode and enjoyed them for 4 years then Pedego came out with the Boomerang Plus. One ride on the new Boomerang Plus had us. We traded in our two City Communters for two new Boomerang plus. Why, as I said the City Commuters were great however the Boomerang Plus with the very low step in, mag wheels and greater power and range instantly persuaded us. Our mid sixties bodies greatly appreciated the very low step in on the bikes. For three years now we ride our Boomerang Plus whenever the weather allows. Pedego= great bike, highest quality and service after the sale has been second to none. The Boomerang Plus changed my life!! After back surgery, my bike riding was causing me pain, too much pressure on my spine. Combine that with bursitis in both my wife’s hips and we were spending Sundays watching TV instead of riding at the beach. So we opted to buy a couple of electric bikes and now we ride at least twice a week and sometimes 3 times. It has given us a sport we can do together and spend a wonderful day outside in the California sun!! I love it! Mobility and balance issues limited my ability to get on most bikes. The Boomerang is perfect for me! The throttle lets me get up to speed quickly which lets me get past the wobbly stage. We love our pedago bikes! My wife each have one. We have a motor home to travel the country and use our pedago bikes to get around where ever we go ! Rather than pulling a car behind us. My Pedego Boomerang electric bike gets me back on my childhood passion (Riding My bike again). I can go up any hill in my neighborhood with ease. I am exercising again.My Local Dealer provides excellent service. I have taken my bike on vacation. I highly recomend this brand. 66 years young and had a 7 speed bike that I liked but rarely rode because my wife who rode with me became unable to balance hers. We seen the Trike at Myrtle Beach Pedego and she loved it so we bought it and my Boomerang. We ride a lot together and I put over 400 miles on mine just riding around our neighborhood. 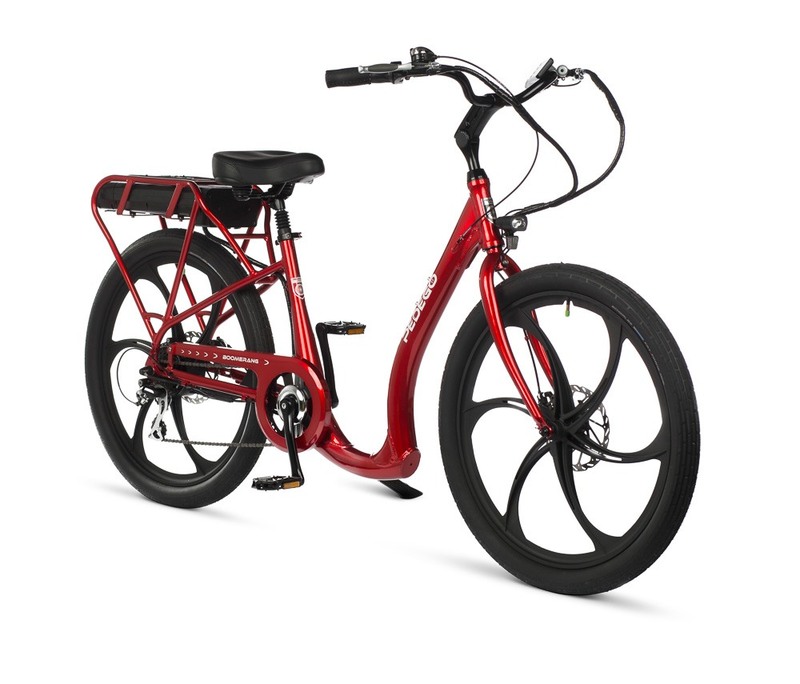 The Pedego Boomerang is the perfect way for anyone who loves to freedom of cycling but has bad knees to continue the sport for many years without the pain. You get a great workout that helps your flexibility without the pain caused by going up steep hills with no power assistance. It’s the perfect outdoor exercise machine and the high quality makes it worry free when traveling over distances. Strongly recommend a test-drive to anyone who is seeking to stay active with further damaging their knees. My husband and I bought 2 e-bikes on line last year with our income tax returns.I got a Pedego Boomerrang for me and another (good) brand for my husband. After the bikes arrived and a few short trips, my husband decided that he wanted a Pedego instead. We love riding bikes but as we have gotten into our middle ages, the multiple hills around our home take up a lot of time. With our Pedegos we don’t think twice about going for a bike ride after work. The Pedegos give us level playing field so that we can ride together. Last year we rode all over the states of Oregon, Washington and Alberta, Canada. Everywhere we ride, someone always stops me to ask about our bikes. I started to carry Pedego cards to hand out. These were the best investment of my income tax return! Having been an avid cyclist in my younger years 40-50 years ago its exciting to get reacquainted with the Washington DC bike trails that I have not seen for many a moon! I love my Pedego cargo bike!! I just purchased the bike this past summer, and cannot wait until it warms up to get back on it again. My son rides on the back, and when we are staying local we don’t even need the car- we prefer to take the bike when we can! You have NO idea what you're missing out on!